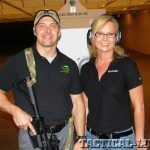 Brian Garrett from Telluric Group and Kristi Drawe from Aimpoint hosted the event at Telluric’s training facility in Brunswick, Georgia. 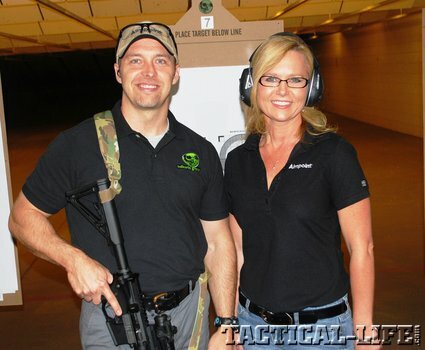 Daniel Defense provided rifles for the event. 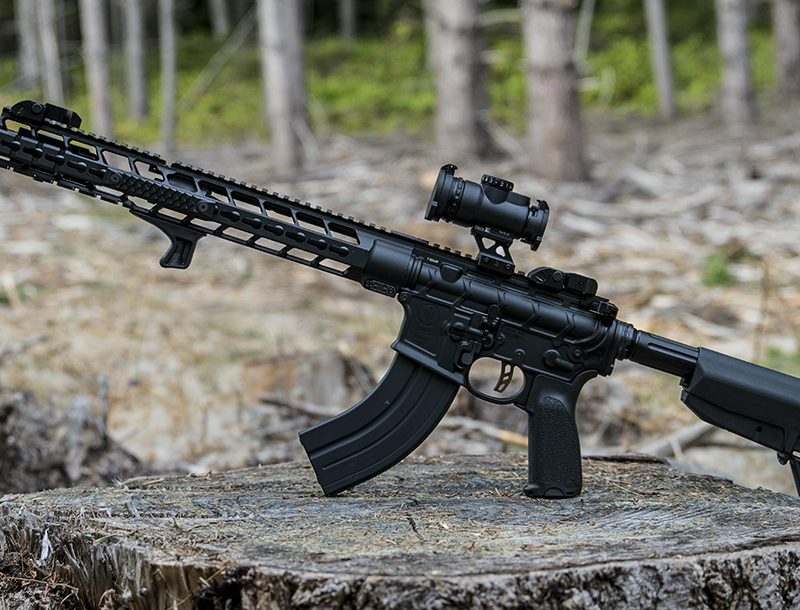 The author ran this 10.3-inch SBR with an Aimpoint CompM4 optic. The Aimpoint optics are ideal when shooting from non-standard positions. Here, a shooter engages targets from the bottom opening of a 9-hole wall. Brass flies as a shooter engages a moving target. The Aimpoint optic allows the shooter to keep both eyes open. 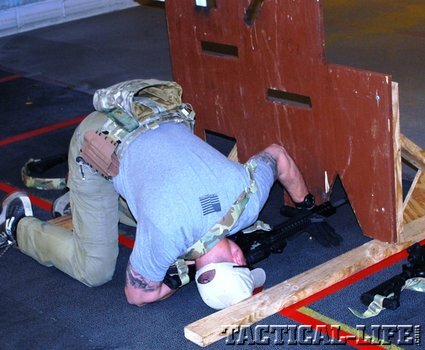 This provides better situational awareness and rapid target identification and engagement. Law enforcement officer Tim Lau runs the X-Box drill. Writer’s ran through a shoot-house drill with UTM training munitions. Engagements were extremely rapid and at room distances. 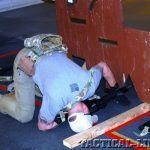 A trifecta is created when three or more elements come together, and this is the perfect description for the recent Aimpoint writer’s event. 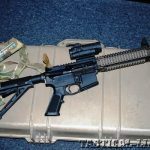 Aimpoint (aimpoint.com; 877-246-7646) partnered with Telluric Group (telluricgroup.com; 904-565-2647) and Daniel Defense (danieldefense.com; 866-554-4867) to provide a comprehensive one-day training event where attendees were able to become familiar with Aimpoint’s line of optics and put a significant number of rounds downrange. The event was hosted at Telluric Group’s training facility in Brunswick, Georgia. 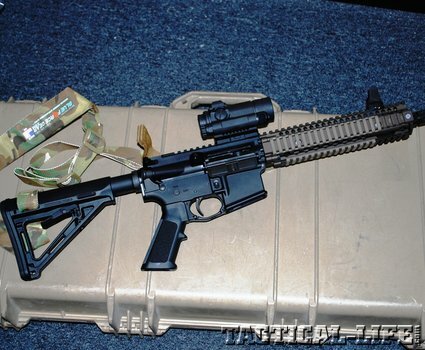 Daniel Defense provided the rifles for the writers. 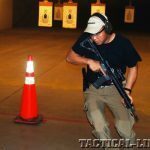 Telluric Group opened their doors in 2004, with the mission to provide quality firearms training with an emphasis on the tactical use of night-vision equipment. Since that time, they have expanded their portfolio to include security consulting, executive protection and convoy operations in high-risk environments. The facility features a multimedia classroom, a 10-lane, 25-yard indoor range that is rated for .308, and a 500-square-foot, non-lethal-ammunition shoot house. The shoot house has reconfigurable walls, 3-D falling targets, an attic and an observation platform. In addition, lighting on the range and in the shoot house can be optimized for low-light and NVG training. 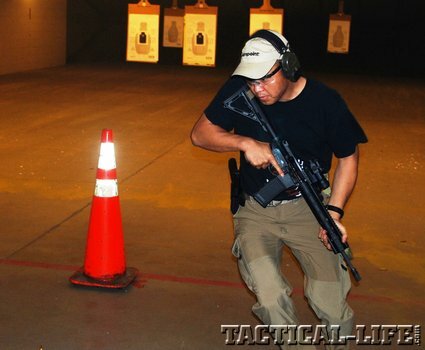 Aimpoint and Telluric have partnered to develop and teach a comprehensive “elite-level 2-day rifle/carbine course to military and law enforcement units.” The Close Quarters Optics class is specific to Aimpoint products and covers nomenclature, maintenance, operations, capabilities and limitations. The goal is to allow the user to deliver fast and accurate first-round hits on target, at operational ranges. The course arose from misunderstandings (and, in some cases, pure ignorance) in the proper use of the red-dot optic. 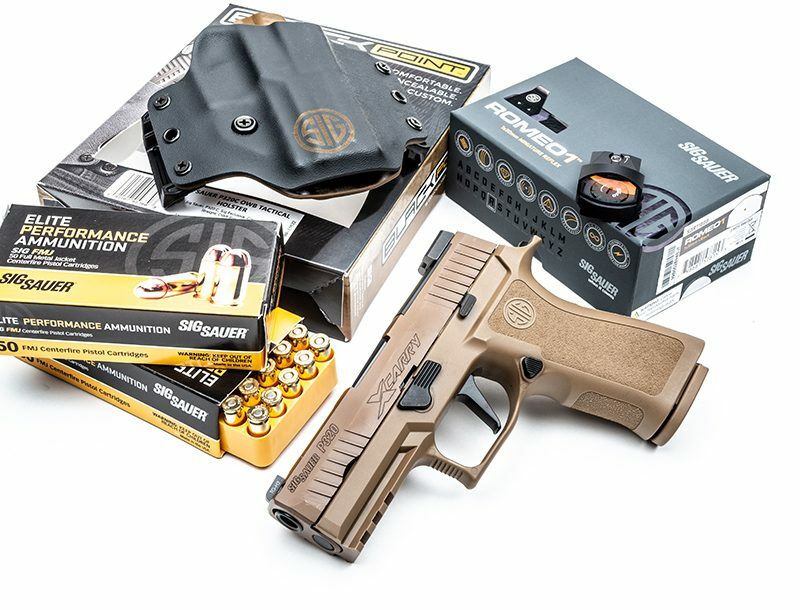 To quote Matt Swenson, Aimpoint’s vice president for government sales, “The performance of any company’s products is only as effective as the knowledge and expertise of the end user—this is why training is so important. By partnering with the Telluric Group, Aimpoint now has the ability to provide official users a high level of training in the application and use of our products.” I personally know of cases where troops were issued Aimpoint sights just prior to a combat deployment, with no instructions. Even more alarming, armorers have told troops that they only had to place the red-dot on top of the iron front sight and that no zeroing was necessary—nothing could be farther from the truth. The two premier sights offered by Aimpoint are the CompM4, which has been type-classified by the U.S. Army as the M68COO, and the Micro T-1. With the mount, the CompM4 is 4.7 inches long and 2.8 inches high and weighs 11.8 ounces. The 2-MOA red-dot is powered by one AA battery that provides 80,000 hours of continuous use. With nine daylight settings and seven settings for passive night vision, the CompM4 has a proven record under the most extreme conditions imaginable. Since its adoption, more than 1 million CompM, CompM2 and CompM4 sights have been delivered to the U.S. military. The new king of the hill is the Micro T-1. 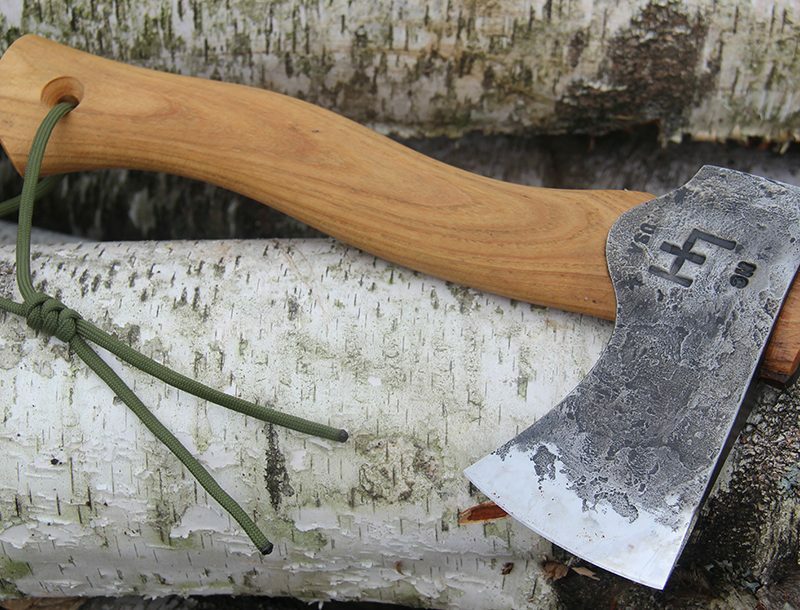 Appropriately named, the T-1 is only 2.4” in length and weighs a mere 3.7 oz with the mount. The T-1 is a fully capable optic with eight daylight settings and four night vision settings. A single CR2032 lithium battery provides over 50,000 hours of continuous use. The T-1 offers considerable savings in weight and size over the CompM4 without sacrificing any performance or durability. In addition, the T-1 can be mounted on pistols or used as an alternative sighting system on precision rifles such as the M110 SASS. The seminar started with an abbreviated presentation of the overview given in the full course. Brian Garrett from Telluric Group and Matt Swenson from Aimpoint briefed the attendees on the red-dot optic’s history and reviewed Aimpoint’s line of optics: the importance of a proper zero, mounting options and applications were covered, along with the misconceptions, limitations and improper uses red-dots. Jordan Hunter and the great folks from Daniel Defense drove down from Black Creek, Georgia, with an assortment of DD rifles for the event. 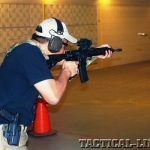 I had recently completed a review of the DD MK18 SBR and was very impressed, so I selected a similar rifle that was set up with a CompM4 for training. 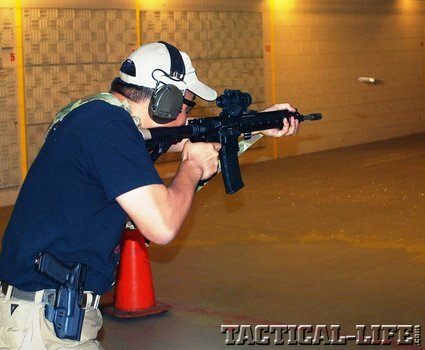 We headed to the range and locked and loaded using PMC ball ammunition and Magpul PMAGs. By the end of the day, nine writers had consumed 5,000 rounds of ammunition, and it was no surprise that the entire day was free of malfunctions. After zeroing our optics at 25 yards, we ran a number of drills shooting from 3 to 15 yards, with an emphasis on learning the proper holdover. While holdover may not be required to make a center-of-mass shot, it is critical when making an effective shot to the cranial vault. The more comfortable we became with the optics, the faster the shots and the tighter the shot groups. Then, just when we thought we had the technique perfected, we were asked to place hits inside a 1-inch circle at 5 yards—having no index point on the target for holdover, many of us were challenged and humbled. As the day progressed, we transitioned to moving drills and moving targets. This is where the Aimpoint optics really excel: the use of the zero magnification red-dot optic allows the shooter to track, acquire and engage the target while keeping both eyes open and focused on the target; once the skill is mastered, target acquisition becomes almost subconscious. 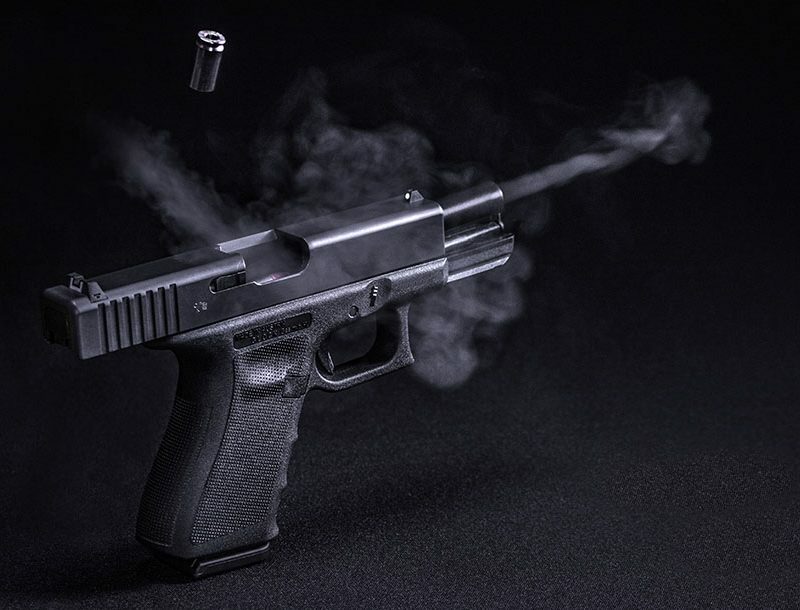 The most difficult was the X-Box drill, where shooters engaged three reduced-size targets with two rounds during each movement. 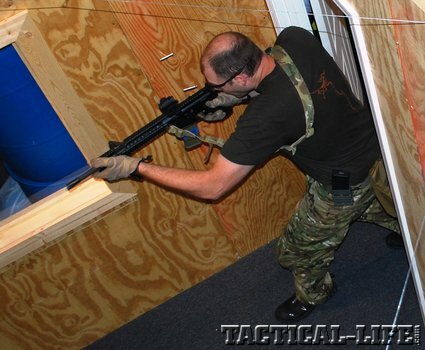 The exercise required separate forward, lateral and diagonal movements while engaging the targets. This was a timed competition, where each miss added 3 seconds to the shooter’s time and the winner would receive an Aimpoint Micro T-1 optic. Given the Type-A personalities present, competition was lively and energetic. 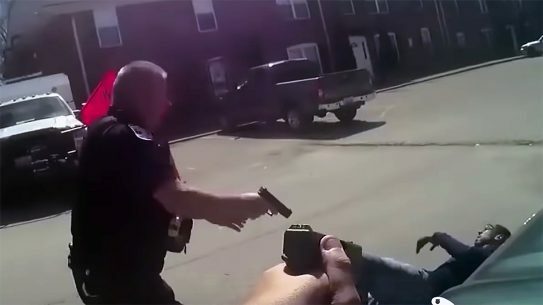 Shooters were required to either shoot while moving or take a step between each two-shot engagement. The more successful shooters moved between shots, with the winning score being in the 53-second range. The last drill involved a building-clearance exercise, using UTM Man Marker rounds in the NLTA shoot house. The exercise was designed to test our skills on multiple targets at close ranges, while moving through several rooms. The instructors stressed that the exercise was designed to highlight the use of the optic and was not tactical in nature. Again, the ease and speed of target acquisition made dropping the targets very intuitive. 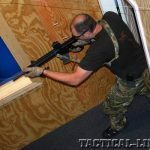 This was the first time I had used the UTM less-lethal munitions, and I was impressed with their ease of conversion, safety features and reliability.